Despite Nashville's obnoxious chants and desperate catfish hurling, the inevitable has happened: the Pens have won the Stanley Cup. While disappointed "Smashville" fans have retreated to their burrows, licking their wounds and vowing revenge, the party's just getting started here in Pittsburgh -- up to half a million people are expected to show up at the Pens' victory parade, which kicks off at 11am on Wednesday. Here's everything you need to know if you're watching in person. According to the mayor's office, this year's championship parade route will be similar to 2016's, with the exception that it will end at Point State Park this time. Starting at 11am EST on Liberty Ave, the parade will head down Grant St and turn right on the Boulevard of the Allies. From there, it'll take a right turn down Commonwealth Place and end up at the entrance to Point State Park, at the Penn Ave intersection. Of course, the street closures required for the parade (which begin at 9am on Wednesday) mean that commuting downtown will be a bit of a nightmare, so if you're driving over, make sure to get in early or park far, far away. What are the best viewing spots? 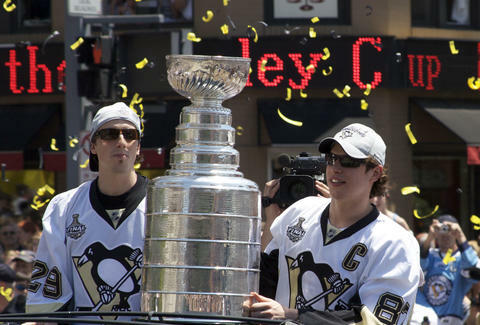 Grant St and the Boulevard of the Allies are the longest legs of the parade, so they should have the most space for you to post up and catch sight of Sidney Crosby and his precious Stanley Cup. That said, if you're interested in attending the post-parade celebration, you'll want to be closer to the Point State Park entrance. There'll be a stage set up in the park, along with large video screens that'll make it easier for everyone to see the players and on-stage activities, but the less walking you have to do to get there, the better your odds of snagging a primo viewing angle. The mayor's office suggests preparing for "hot and humid weather conditions" -- and since last year's parade saw dozens of people suffer adverse reactions to the heat, you're gonna want to take it seriously. Wear breathable, light clothing, and bring along more water than you think you'll need. Rain is a real possibility as well, so bringing an umbrella/poncho likely isn't a bad idea either. We're gonna pretend you didn't actually ask that question, but on the off chance you're unfamiliar with the storied championship history of Pittsburgh's beloved Penguins, here's what yinz need to know. This is the fifth Stanley Cup win for the Pens, coming back-to-back after last year's victory over the San Jose Sharks -- and in fact, they're the first back-to-back champions in nearly 20 years. On top of that, all five of the Penguins' Stanley Cup wins have been on visitor ice, meaning they've never had home ice advantage for a championship-winning game. If you're still drawing a blank as to why you should care about this, just know this: Pittsburgh's own Penguins are now unquestionably an NHL dynasty, which is more than can be said for Philly's Flyers. Also, you're a terrible person. Where should you take the party afterward? If whiskey's what you're after, Butcher and the Rye's 600+ selection behind has you covered -- especially if you accompany it with an order of the taleggio, goat cheese, fontina, Parmesan, and cheddar mac & cheese. Failing that, head over to Pork & Beans for top-notch BBQ offerings (get the brisket, get the ribs, or get both) alongside a selection of 30+ local and regional draft beers. Or, head to Stinky's for one of Pittsburgh's best burgers.